Car crashes at school bus stops have claimed the lives of five children this week, highlighting what law enforcement officials call a "huge problem" with distracted driving. Five separate early-morning accidents in Indiana, Mississippi, Pennsylvania and Florida have ended in fatalities for five students and left six other children hospitalized, two of them with serious injuries. 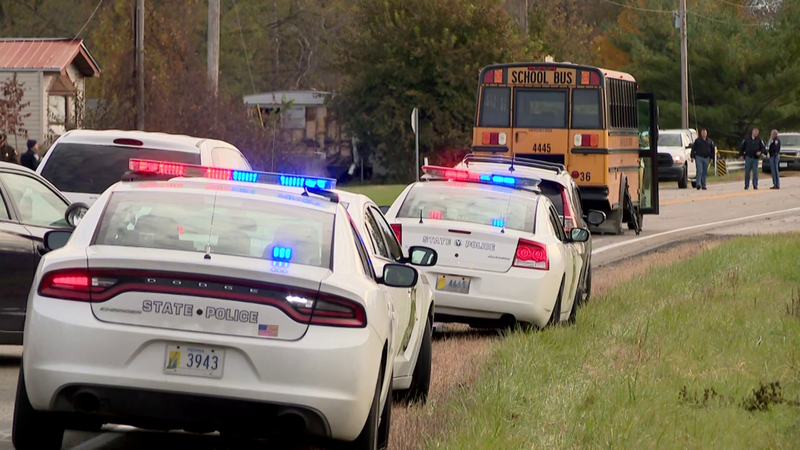 The string of deadly incidents began on Tuesday, when a 9-year-old girl and her twin 6-year-old brothers were struck and killed by a pickup truck while crossing the street to board their school bus in Rochester, Indiana. Another child who was injured had to be airlifted to a hospital. The pickup truck driver has been charged with three counts of reckless homicide. A day later, a 9-year-old boy in Baldwyn, Mississippi, was struck and killed while crossing the street to board a school bus. That same day, a 5-year-old boy was hit by a car and injured while crossing in front of his school bus in Tallahassee, Florida. CBS affiliate WCTV reports the kindergartner has been released from the hospital and is doing well. Then on Thursday morning a 7-year-old boy was found dead by his school bus driver in Franklin Township, Pennsylvania, the apparent victim of a hit-and-run while he waited at his bus stop. Later that morning, five children and two adults were hospitalized in Tampa after being struck by a driver while waiting for a school bus to arrive. Two of the children sustained serious injuries, according to Steve Hegarty, a public information officer at the Tampa Police Department. "This is a huge problem we've been experiencing all around Mississippi," said Captain John Poulos, a director in the Public Affairs Division at the Mississippi Highway Patrol, in a telephone interview CBS News on Thursday. "Distracted driving plays a huge role with stopped school buses." Poulos said motorists passing stopped school buses became such an issue in the state that legislators passed "Nathan's Law" in 2011, which increased fines for illegally passing stopped school buses as well as increased sentencing for offenders when someone was injured. Because of this law, the motorist involved involved in the fatal crash in Mississippi was charged with aggravated assault, and CBS affiliate WCBI reports the charges could be upgraded. Charges have not yet been filed against the motorist involved in the accident in Tampa, according to Hegarty. As smartphone use, digital dashboard displays and other mobile technology have proliferated, so have the number of automobile crashes involving distracted drivers. The most recent data from the NTSB shows 3,450 people were killed and 391,000 were injured in motor vehicle crashes involving distracted drivers in 2015. "Distracted driving is an issue anywhere where people have cellphones, so everywhere," said Hegarty, who noted that the Tampa Police Department was looking at distracted driving as a cause of Thursday morning's accident after ruling out darkness and impairment.